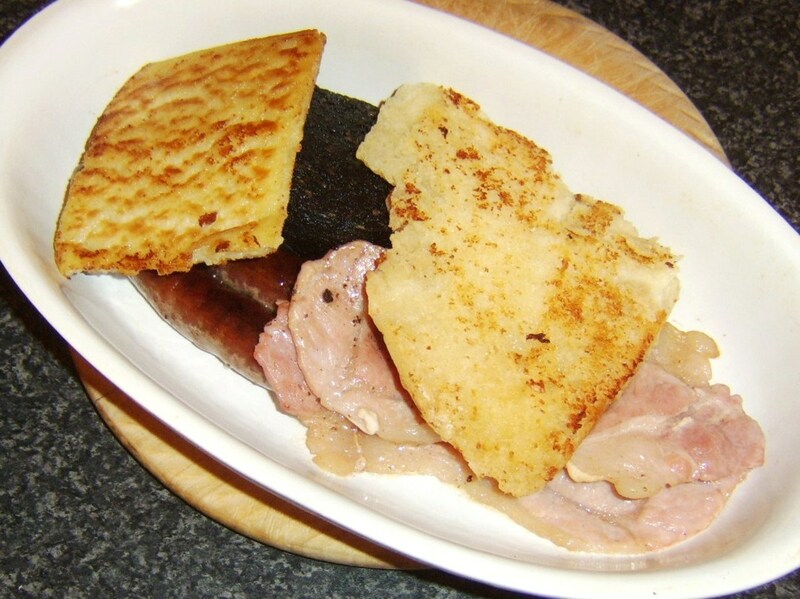 An Ulster fry is a hearty fried breakfast commonly prepared, served and eaten in Northern Ireland. 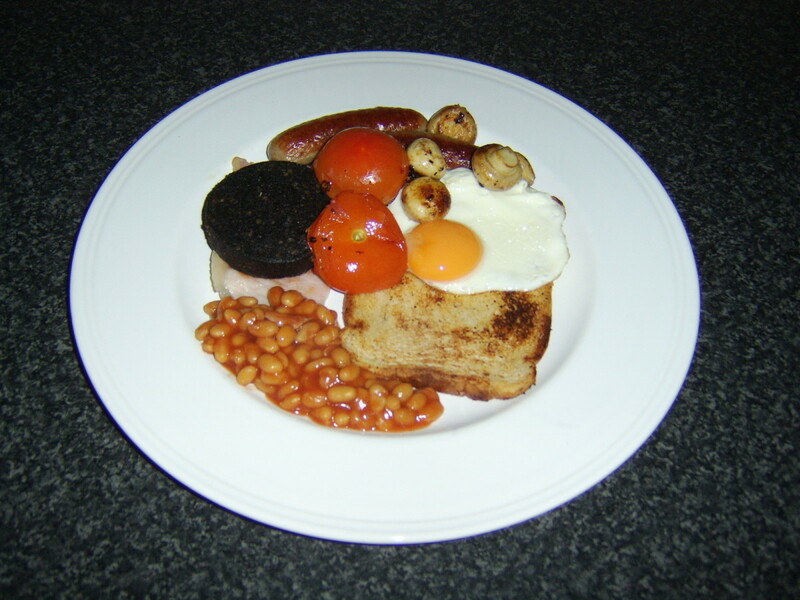 While just like any other fried breakfast, certain ingredients will only be included some of the time, there are those which make the Ulster fry very different from the fried breakfasts prepared elsewhere in the United Kingdom - in England, Scotland or Wales - or in the rest of Ireland and which must be included to make the meal authentic. 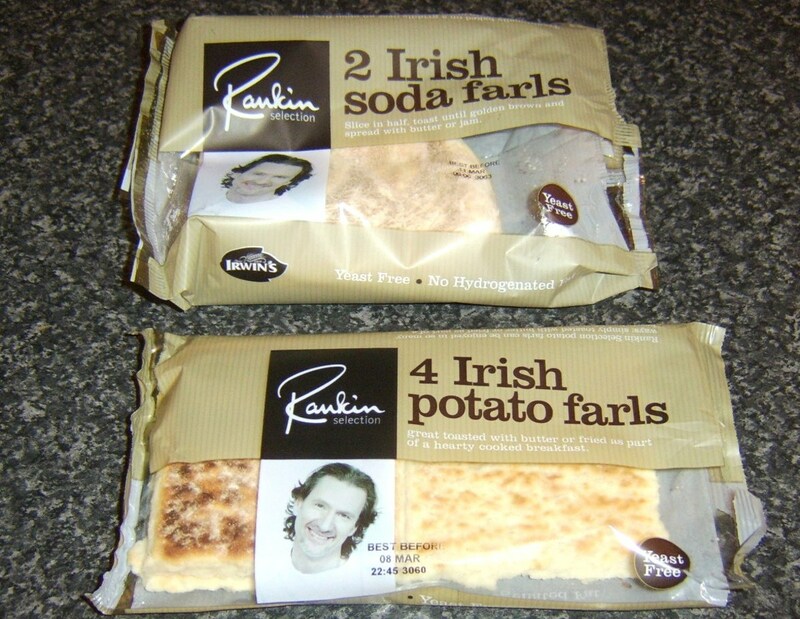 Those ingredients are potato farls and soda farls/bread. 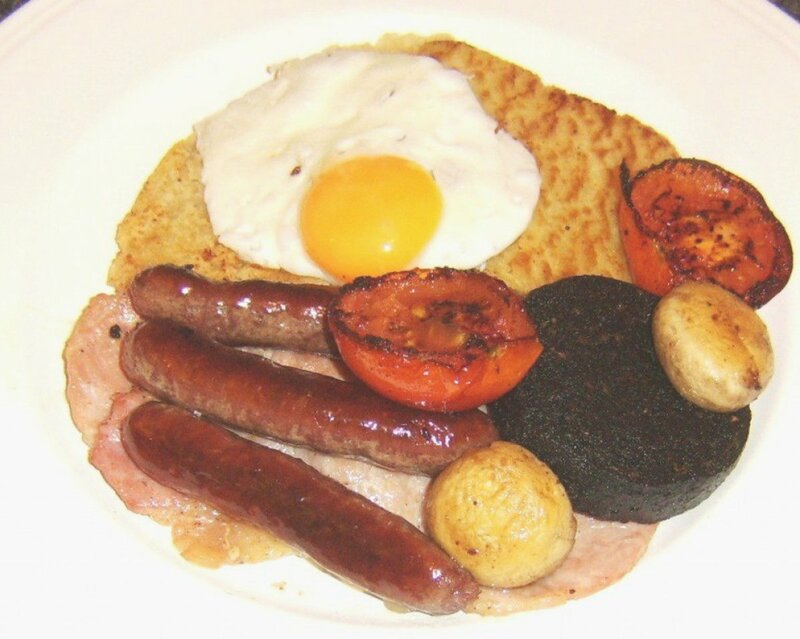 It is also essential to include bacon, sausage, black pudding and at least one fried egg. 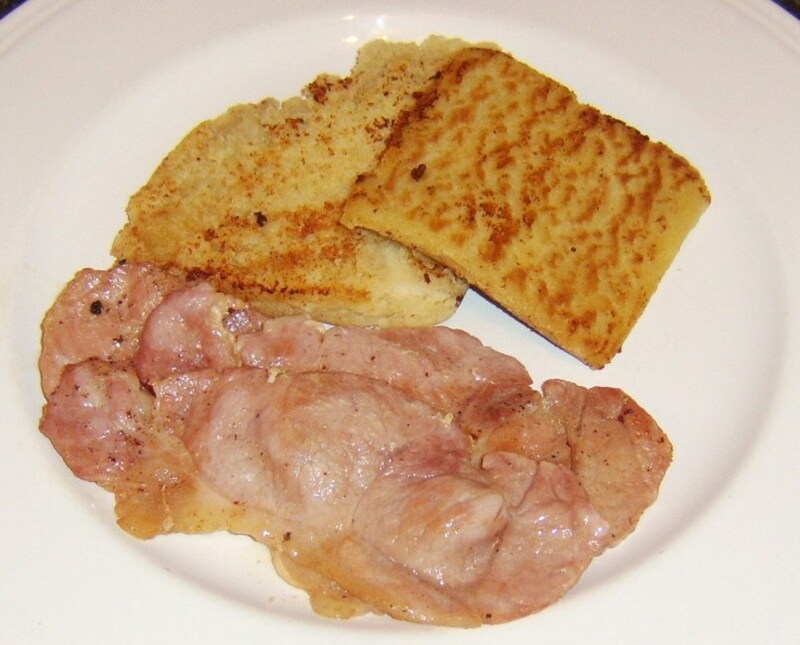 The components of an Ulster fry are traditionally fried in bacon fat so anything which cannot be cooked in this way - like baked beans - should not strictly speaking be served. In order to make some small concession to healthier eating, the items in this recipe have been fried in vegetable oil. 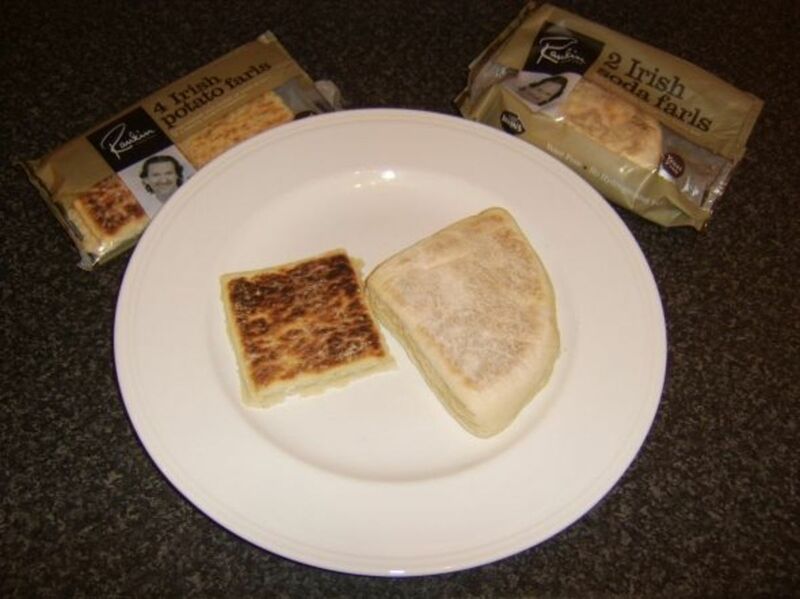 There are a great many people who will not have ready access to soda farls or potato farls in their local supermarket or store. 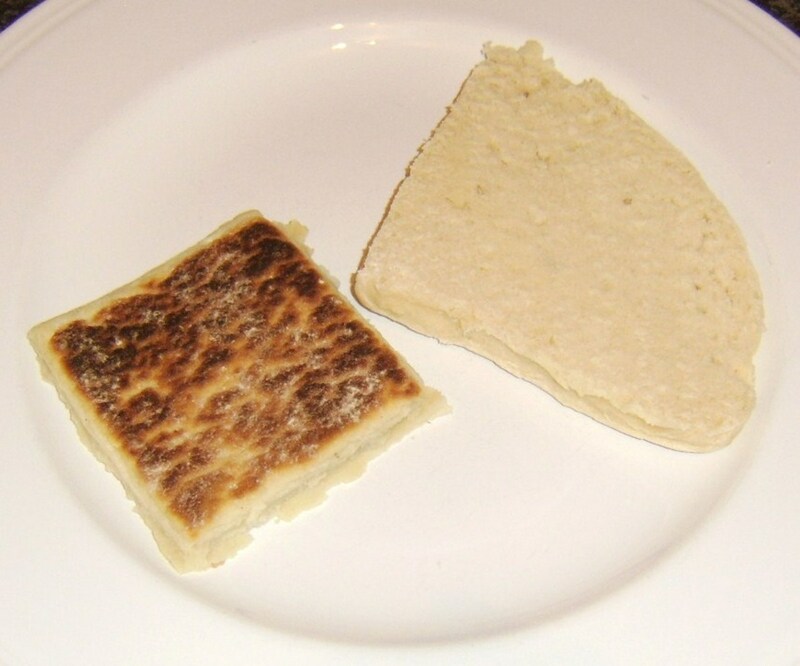 The good news is that both are very simple and straightforward to prepare and this can be done in advance of making the Ulster fry. 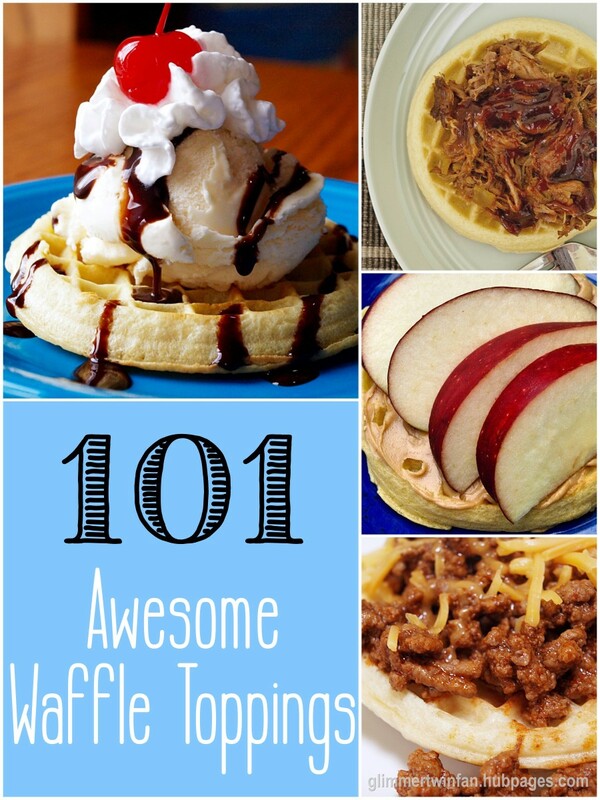 Below are links to easy recipes. 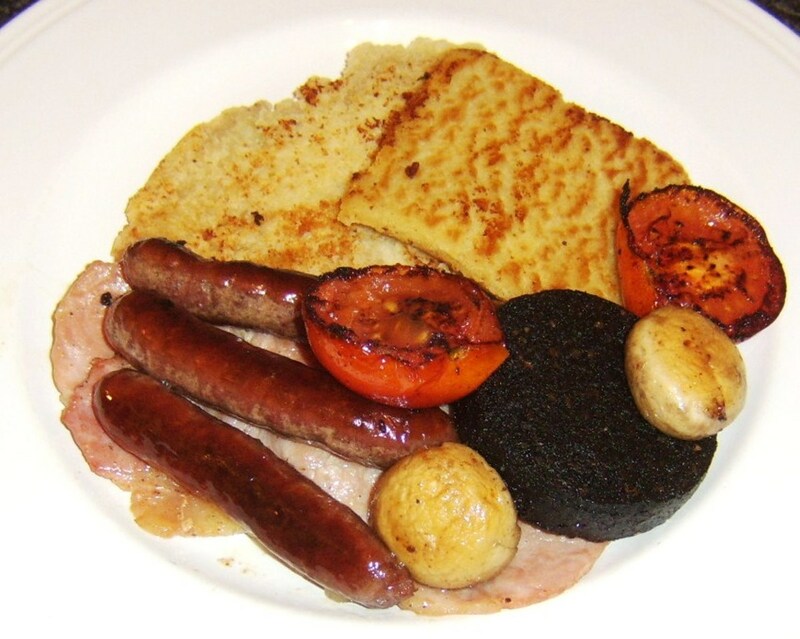 Unless you intend using three or four frying pans to make your Ulster fry, it will be necessary tio cook the different ingredients in stages. This means that a way has to be found to keep them warm as they come out of the frying pan. The easiest way to do this is to begin the process by putting an ovenproof dish in to a very low oven to heat and ultimately keep the food warm. Do this before you start cooking, or immediately after the sausages are added to the frying pan. You should also use a large, sturdy frying pan or skillet and may be interested in checking out some of the bargain deals available on these items on Amazon.com or Amazon.co.uk. 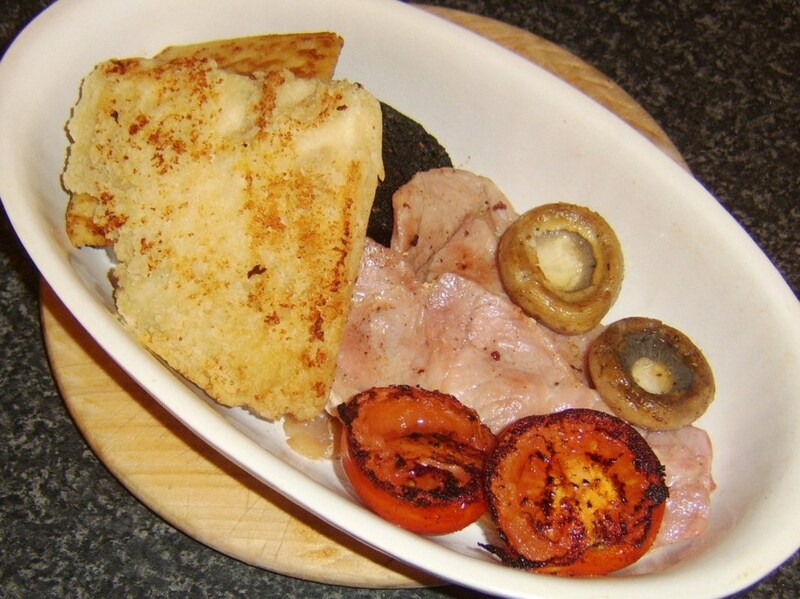 The bacon used in this recipe is back bacon, the most popular kind in the UK. American bacon (called smoked streaky bacon in the UK) will of course work equally well. The sausages will take the longest to cook so have to be added to the pan first. Begin by pouring in a couple of tablespoons of oil. Do not prick the sausages as this allows all the juices and flavour to be lost to the pan. Cook them on a very low heat, turning frequently, for a total of fifteen minutes and they shouldn't burst. 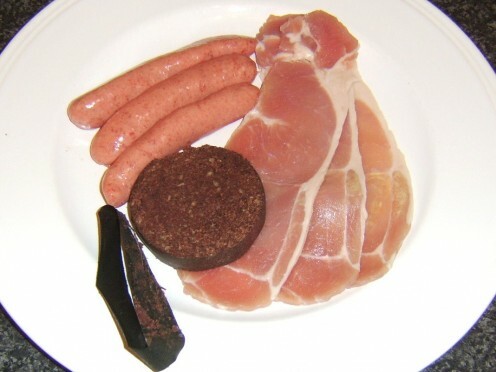 Carefully remove any plastic rind remaining around the black pudding slice. 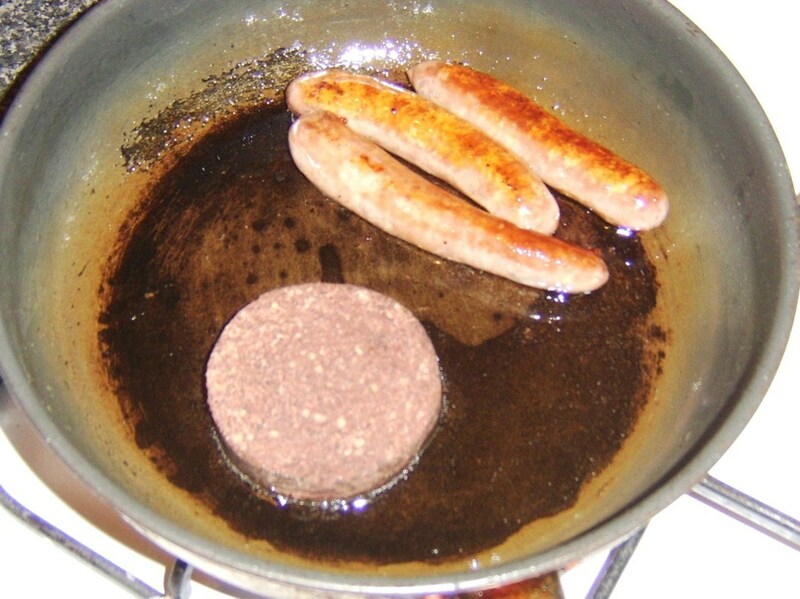 When the sausages have been frying for five minutes, add the black pudding to the pan and fry for five minutes on each side. 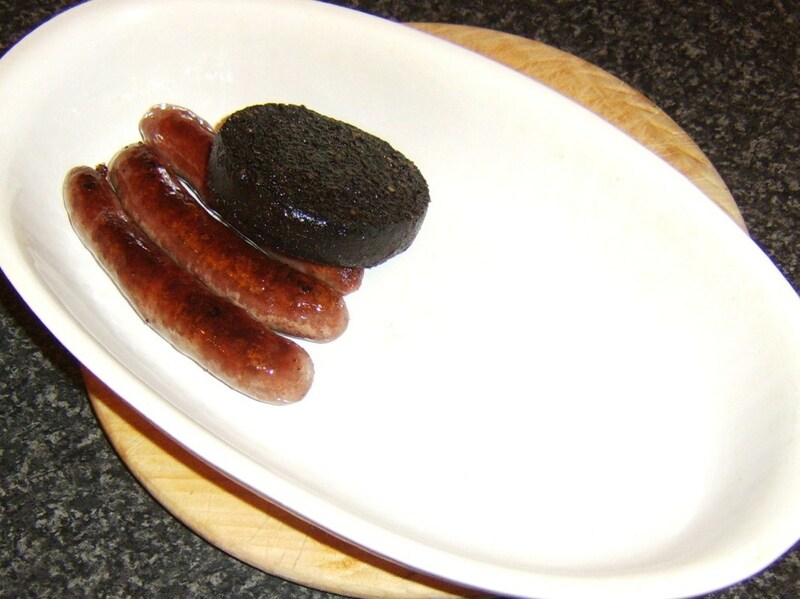 Using oven protecting gloves, remove the heated dish from the oven and lift in the sausages and black pudding. Return the dish to the oven. Fry the bacon in the pan next, for a couple of minutes each side or until done to your liking. Remove as before to the dish in the oven. 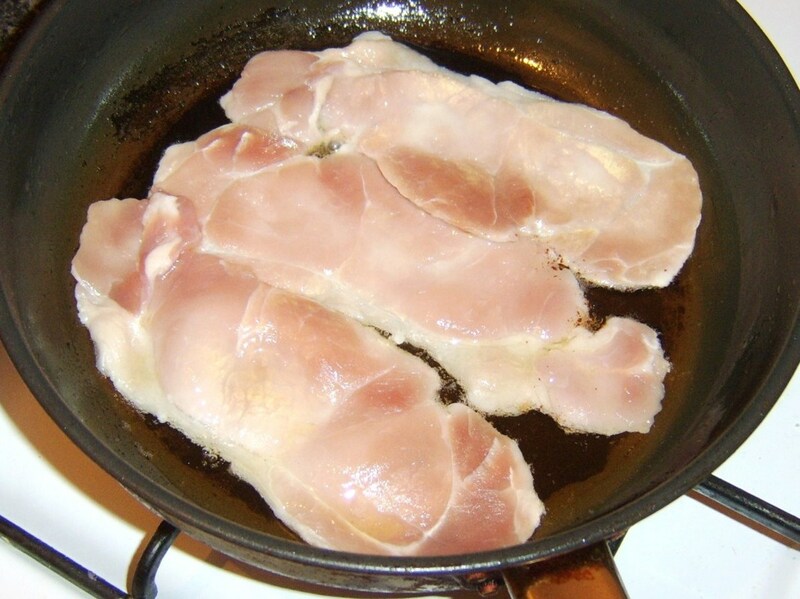 When you have removed the bacon, turn up the heat under the frying pan. 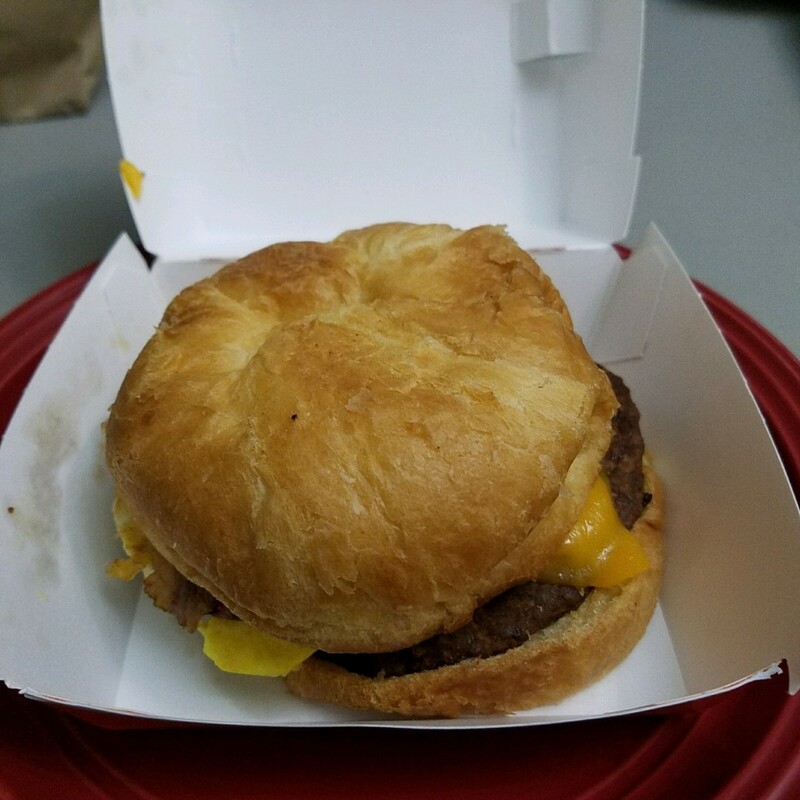 The oil/grease needs to be pretty hot before you add the breads. Otherwise, they will soak up the grease rather than crisp up on the outside. 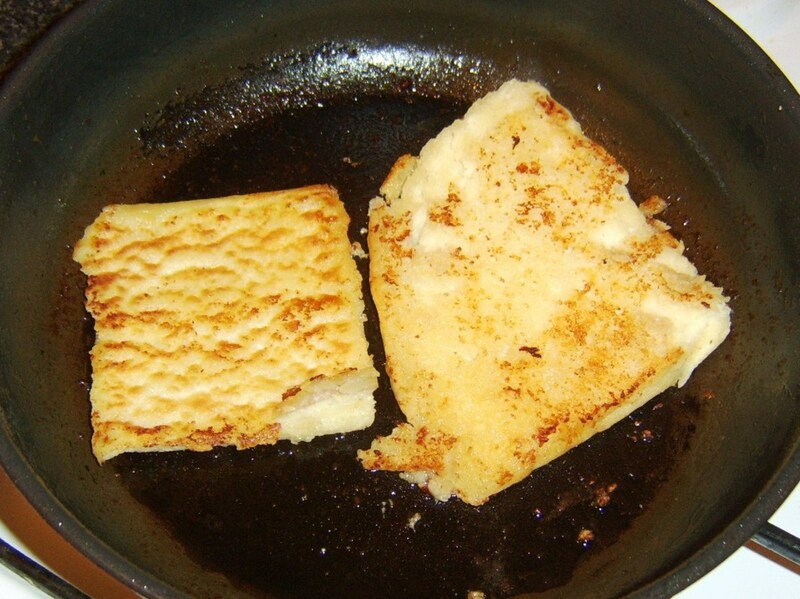 Fry the potato farl and half soda farl for two or three minutes until golden and crisp on both sides. Remove to the holding dish with the meats. 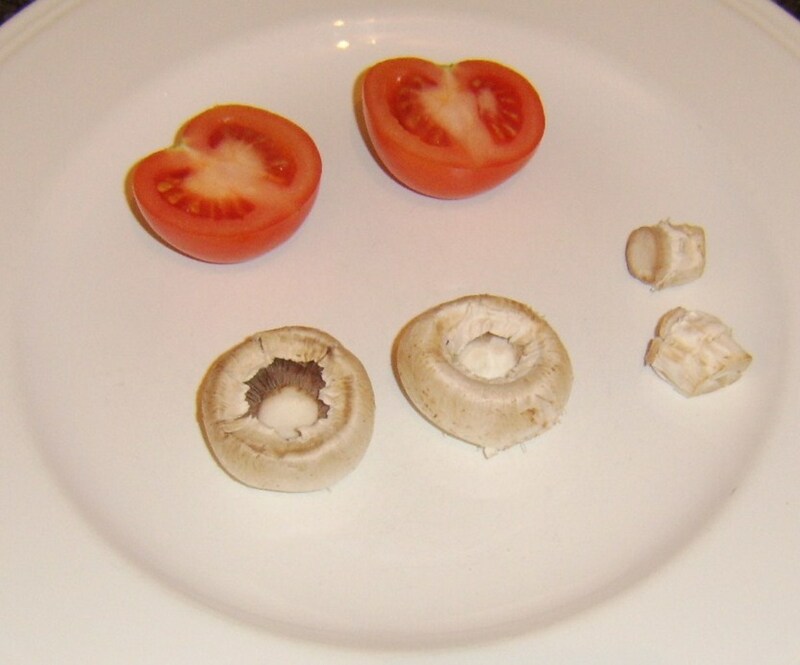 Cut the tomato in half and carefully remove the stalk from the mushrooms. Lay the tomato halves in the frying pan cut sides down. Add the mushrooms initially cup sides up and turn after a couple of minutes. 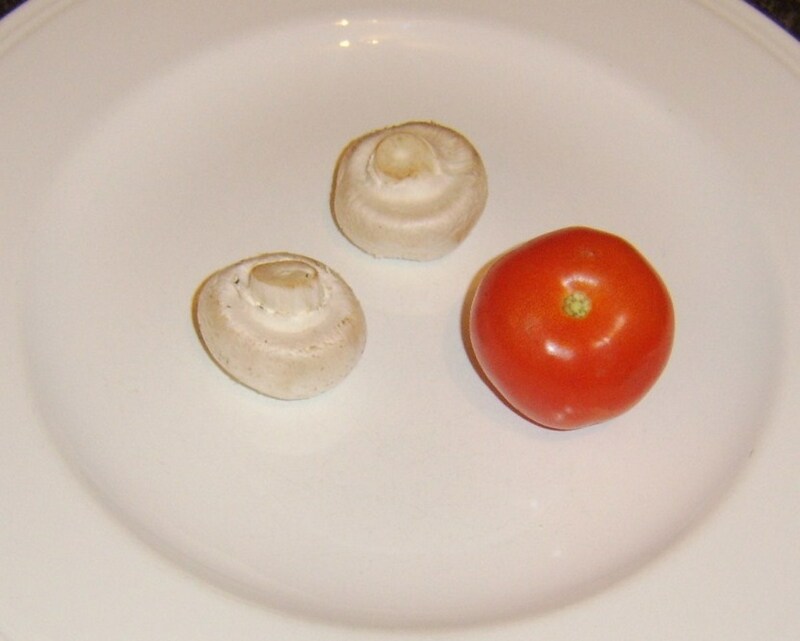 The tomato and mushrooms now become the final items to be added to the holding dish. When cooking an egg by any means but particularly when frying it, you will know far better results if the egg is at room temperature. This means that you should ideally have it out of the fridge at least an hour before it is to be fried. 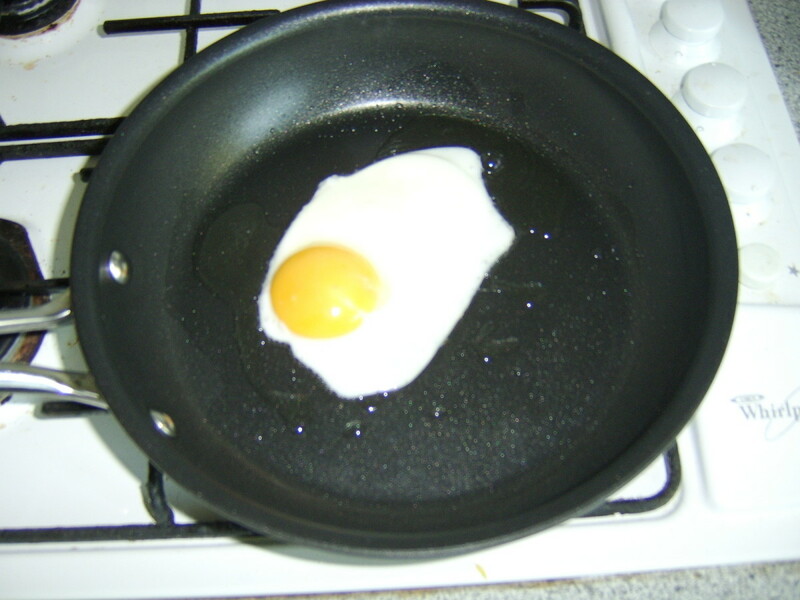 An egg which is to be fried should also be as fresh as possible. The various meats and particularly the tomato will have left the frying pan in a bit of a mess. This would seriously spoil the presentation of your fried egg and also affect its cooking. 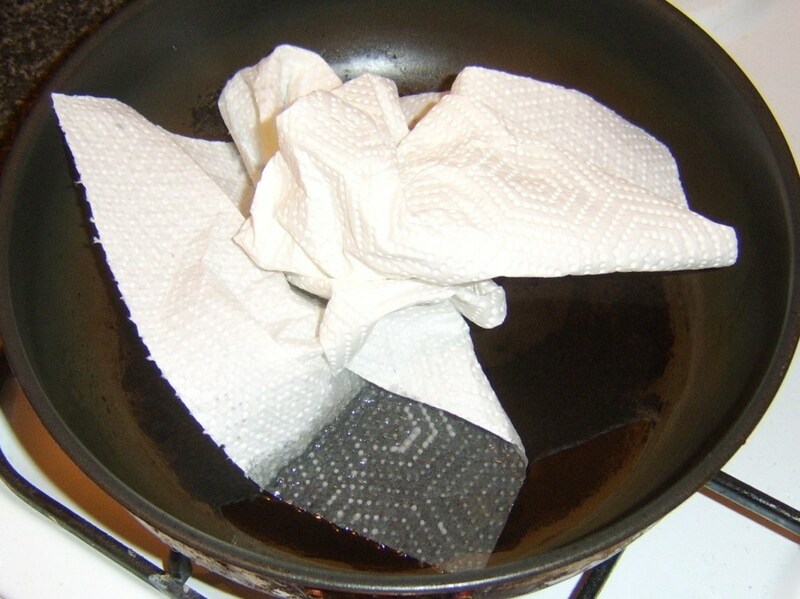 Take therefore a wad of kitchen paper and carefully wipe the pan clean. 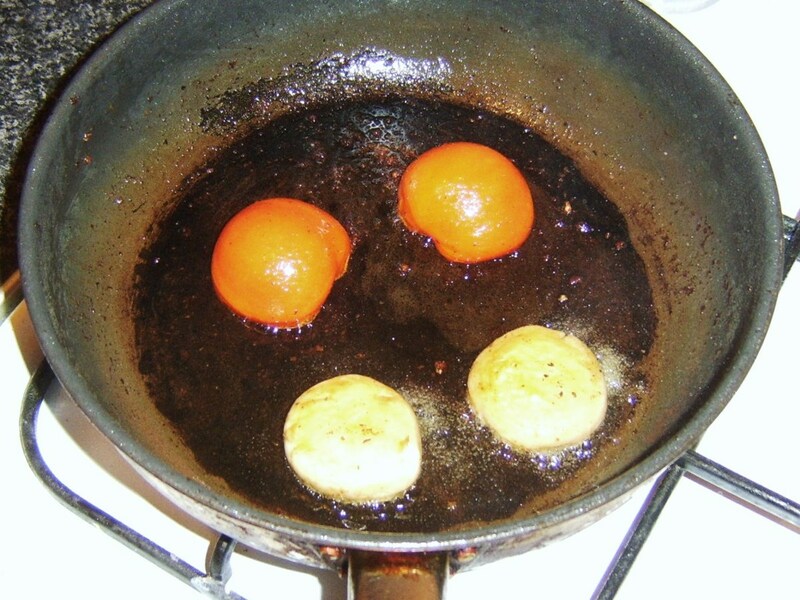 The residue of oil that will remain is all that is required to fry the egg. 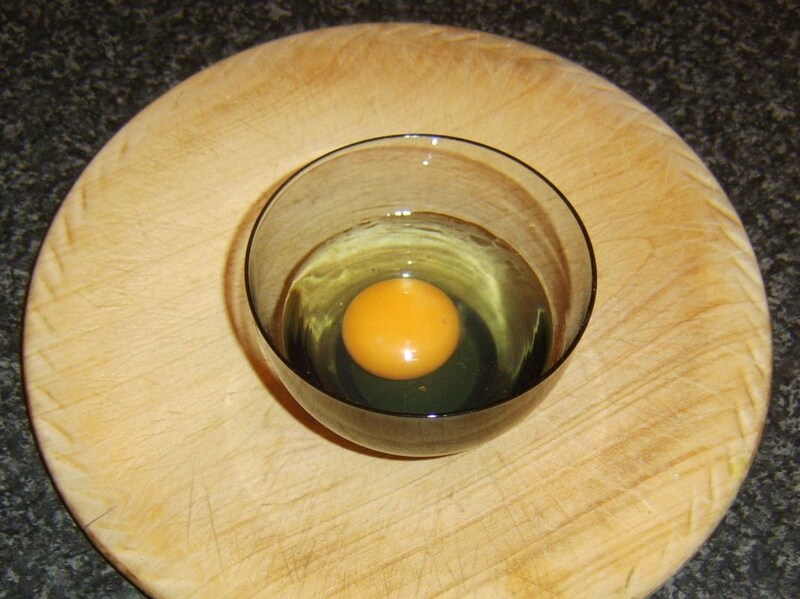 Begin by breaking the egg in to a small cup or bowl. This makes it much easier to pour in to the frying pan and prevents any errant shell being fried in the egg. Bring the pan up to a high heat. This will allow the egg to start cooking immediately and help prevent it spreading out all over the pan. 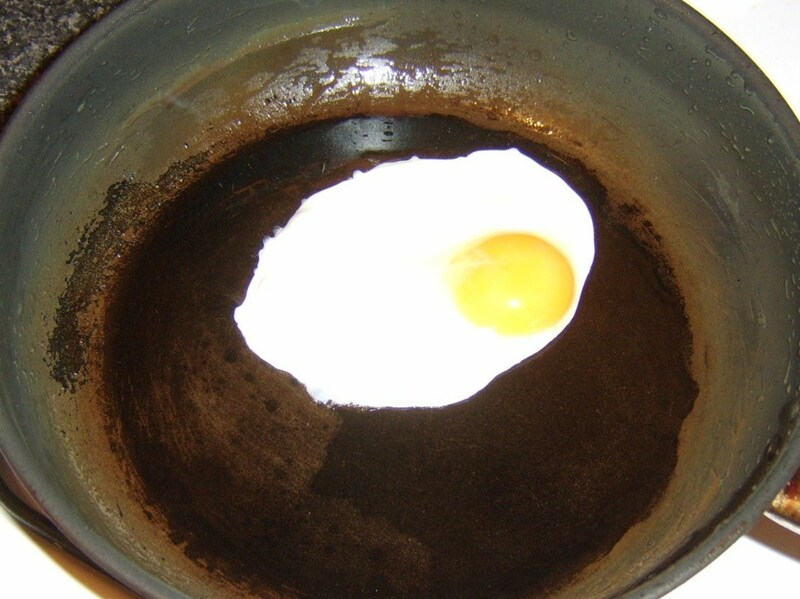 Carefully pour the egg in to the pan and reduce the heat to low to medium after a few seconds. Fry the egg until you can see the albumen (white) around the yolk is completely set. This will take three to four minutes and give you the perfect egg fried sunny side up. While the egg is cooking, begin plating up the other ingredients as described below. 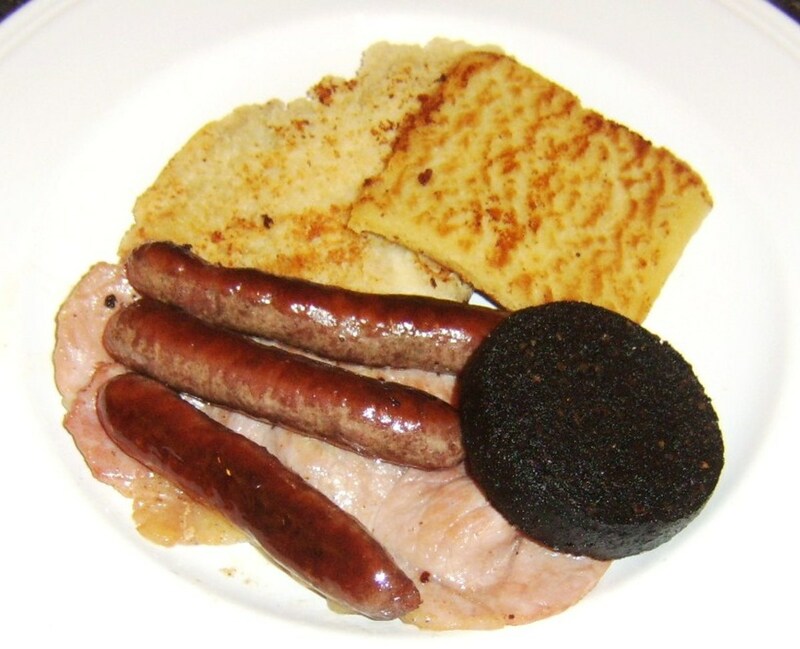 You can of course plate the components of your Ulster fry in any way and in any order you wish. The following is therefore merely a suggestion. 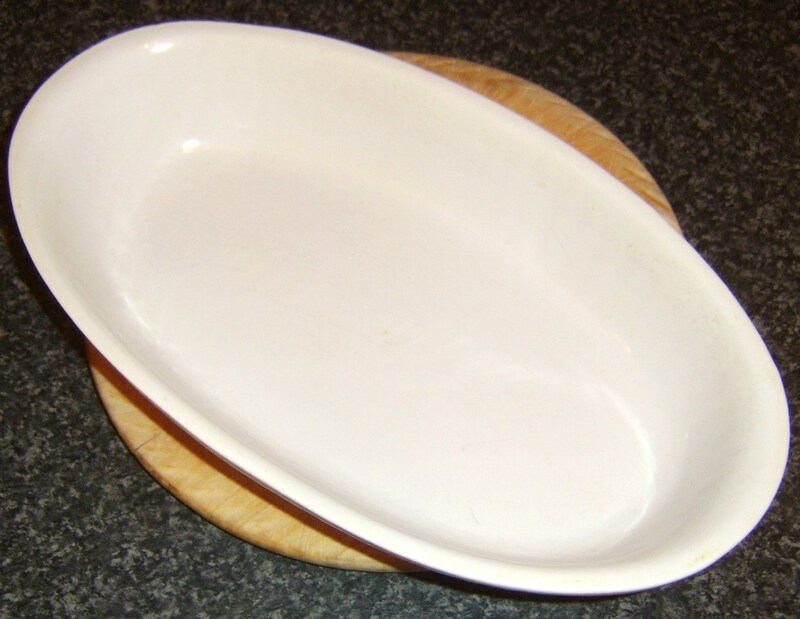 Take the holding dish from the oven, remembering to use oven gloves, and turn the oven off. Using cooking tongs, lay the bacon rashers on half of a heated serving plate and the potato and soda farls on the other half. 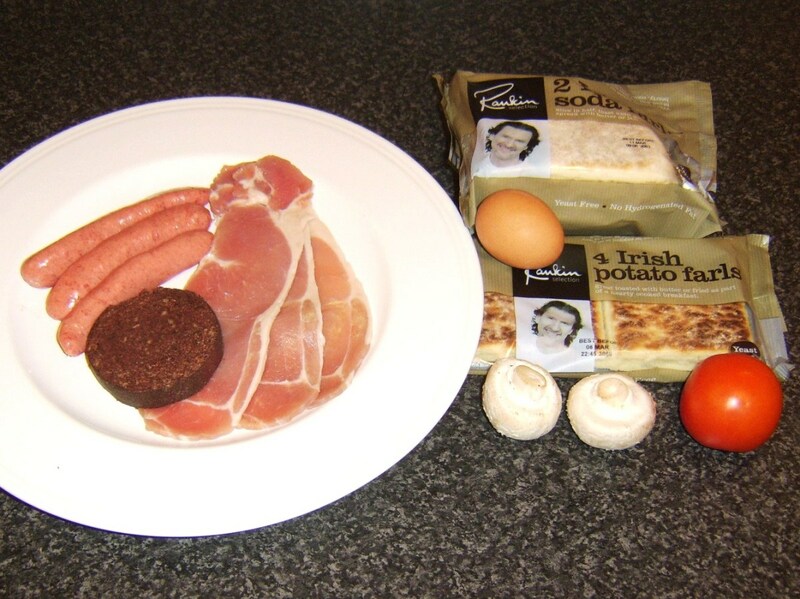 Lay the sausages and black pudding on top of the bacon, followed by the tomato halves and mushrooms. When the fried egg is ready, use a spatula to lift it on to the farls. 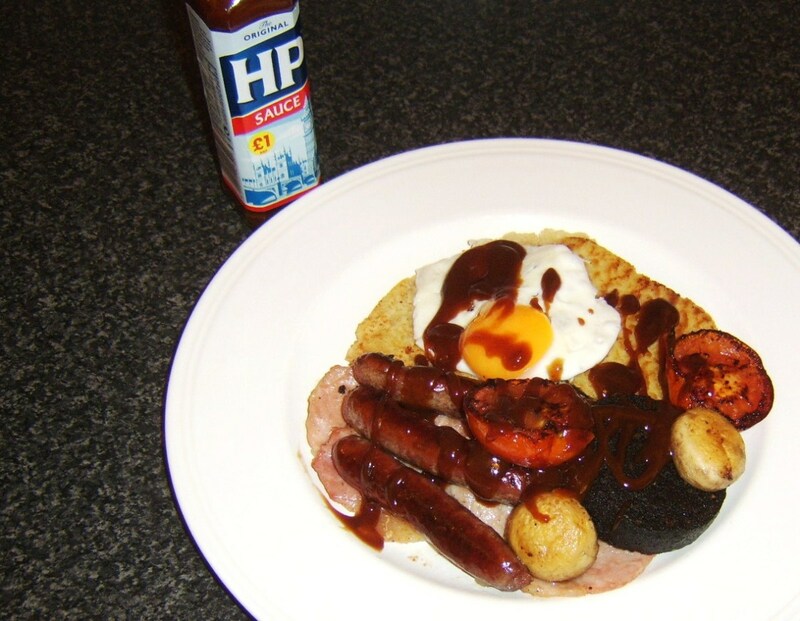 Add HP Sauce if desired and serve with a mug of strong hot tea and maybe some hot buttered toast, depending upon how hungry you find yourself. 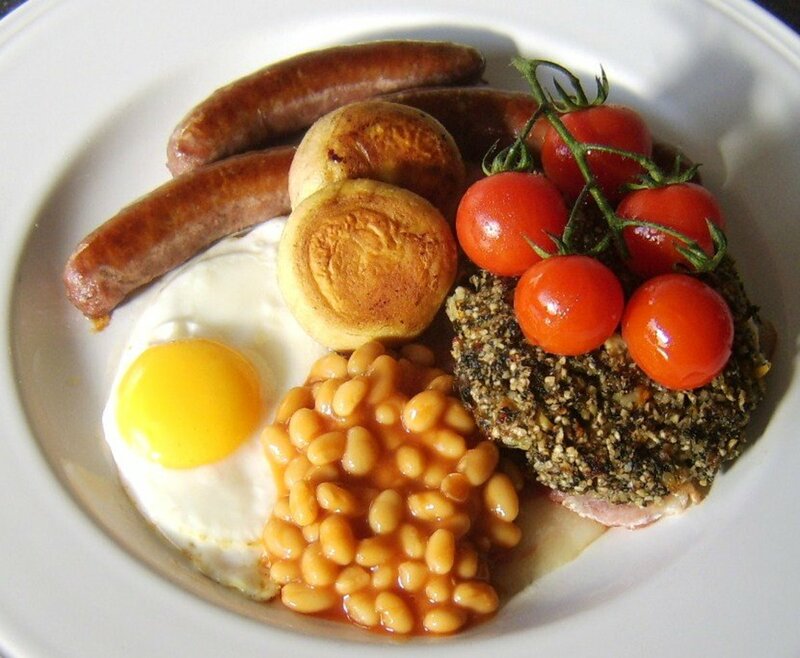 A fried breakfast or fried meal like this of any type is very often referred to as a heart attack on a plate. While this is usually said at least semi-jokingly, the fact cannot be disputed that this is by no means the healthiest of meals and it should ideally only be eaten on an infrequent basis. Perhaps you enjoy it on a Sunday morning as a curer for a heavy night the night before? 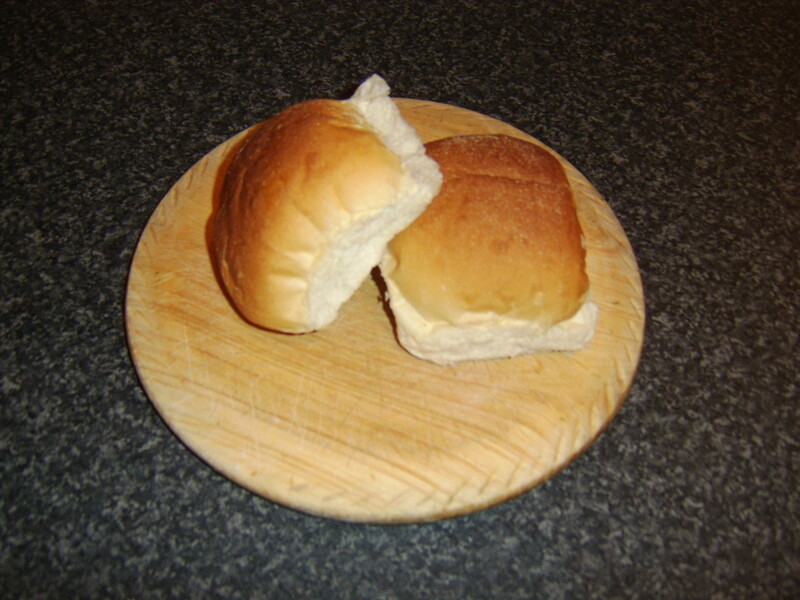 (It is widely believed to be the perfect cure for a hangover!) 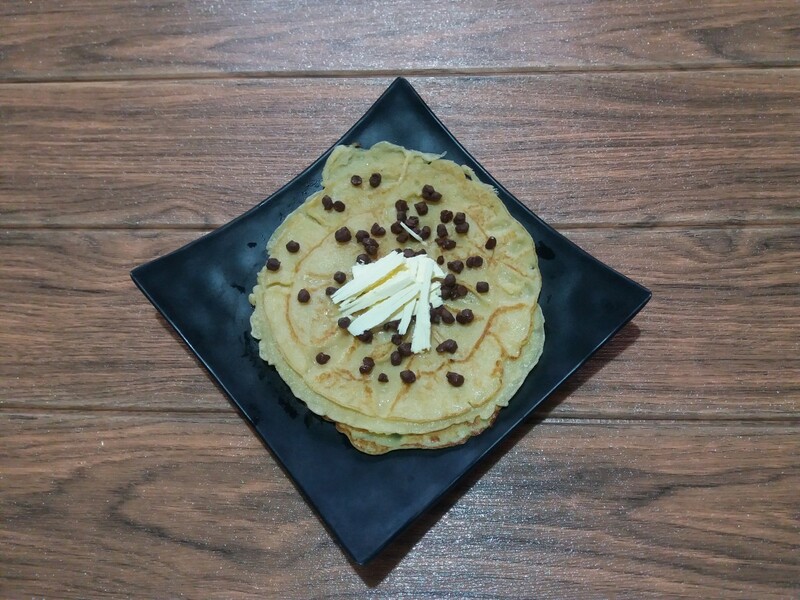 Maybe a Saturday or Sunday morning are the only days of the week where you have the required time to spend preparing this type of breakfast? 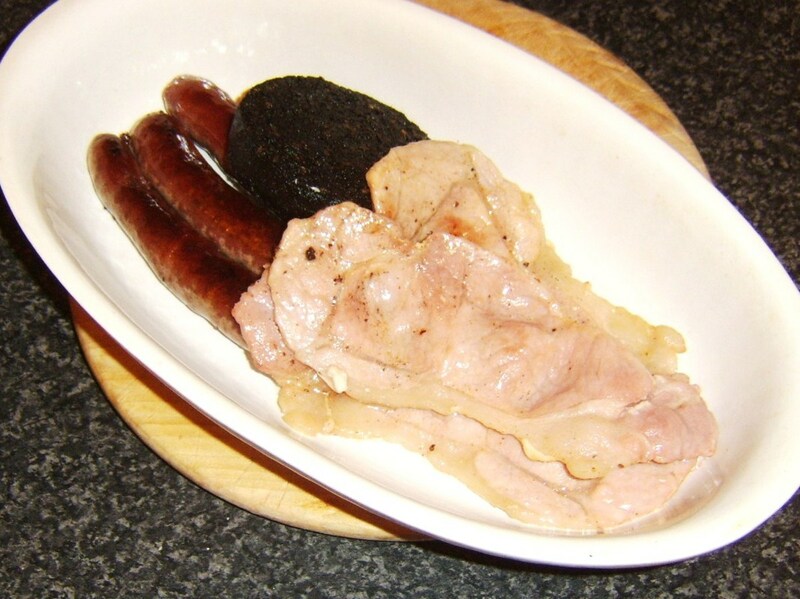 It could even be that you want to try this for the first time on the morning of St Patrick's Day, to give your stomach a solid lining before you engage in an excessive amount of the black stuff? Remember also that an Ulster fry does not have to be eaten for breakfast but can be enjoyed equally well as a brunch, lunch or dinner. Like this Recipe Idea? Please Star Rate it Below! This looks yummy.. Thanks for sharing.. I'm so intrigued by the farles! The sausage? Not so much! :o) Thank you for enlightening me about this delicious breakfast of your culinary heritage! This looks delicious - I'd never heard of farls before reading this, but it does sound like they'd be wonderful with the egg and sausages. I had to smile when I read the suggestion to have the Ulster Fry with a strong cup of tea, I've had Irish tea and strong is an understatement! I really love the step-by-step directions and original photos. Great job!